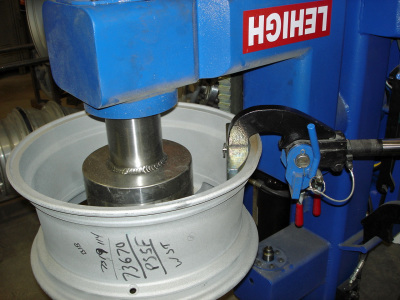 When a bent alloy wheel is installed on the Hi-Tech Lehigh Wheel Straightening machine, it is quite straightforward to locate the bent by turning the rim around. 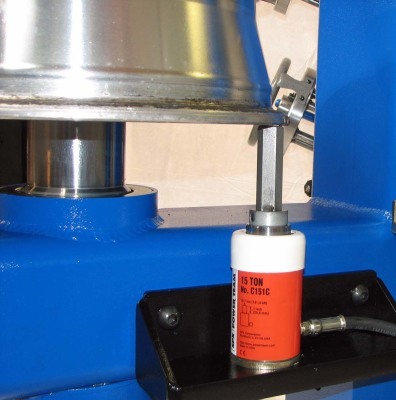 Then, it is recommended to heat the local bent area before applying hydraulic force. After that it is a matter to apply the correct tooling and fix the bent in a matter of minutes. 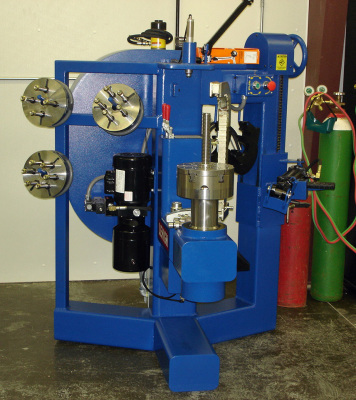 The major advantages for using Hi-Tech Lehigh SR-2410 rim straightening machines are listed below. 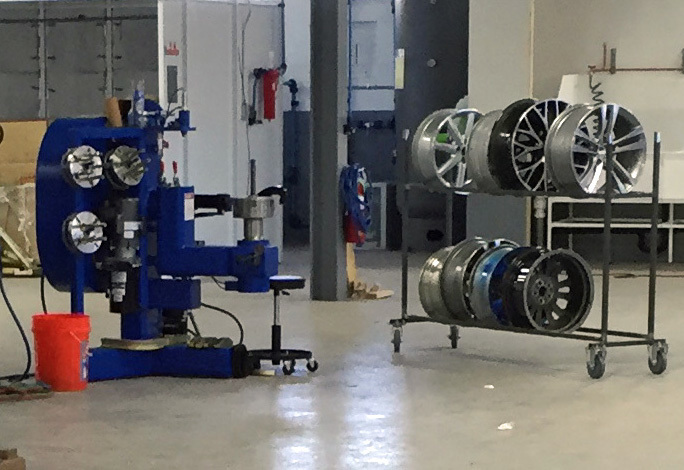 One of the most important features for any wheel straightening machine is that it has the best hydraulic system to be able to extremely strong but yet moving slowly without cracking the alloy wheels in the process of fixing it. 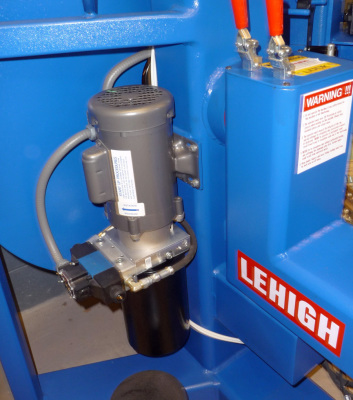 High quality American Made Motor & Pump on Lehigh Rim Straightener. 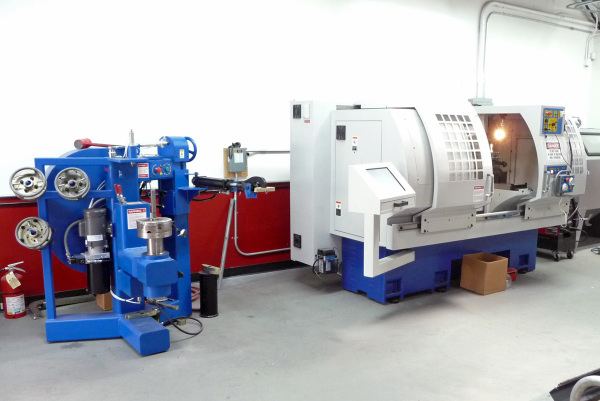 High Tech Lehigh SR-2410 rim straightening machine is delivered to another shop. Top Quality Hydraulic Cylinder has two way actions for easy Push or Pull with very high efficiency. 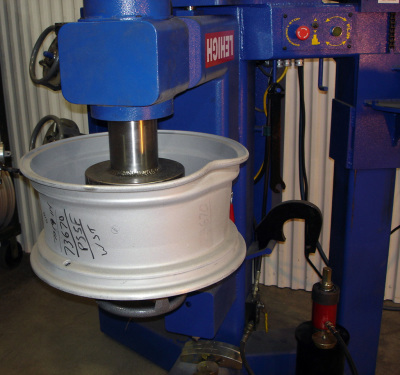 On the market, we have seen many low cost wheel straightening machines imported from other countries with a small piston that could be hold by hand in order to pushing the bent wheels. This kind of small piston is designed for lifting some heavy equipment with lots of force, say, 10 TON as seen in Auto Parts shops. The problem with this kind of piston is moving TOO FAST without any control or measurement. Therefore, most likely, the alloy wheel will be cracked right away before the bent is fixed, which happens every day. Another problem is that this kind of piston moves in ONE Direction – Pushing Out Only. 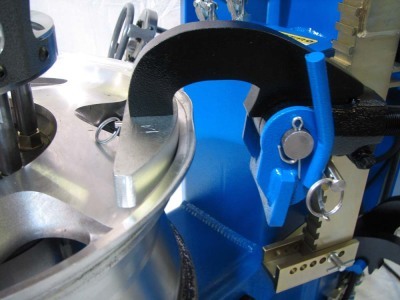 In comparison, on Lehigh Hi-tech Wheel Straightening Machine, not only we have a designed hydraulic system so that it works with very powerful force and very slow movement, but also the hydraulic cylinder moves both ways: IN and OUT. 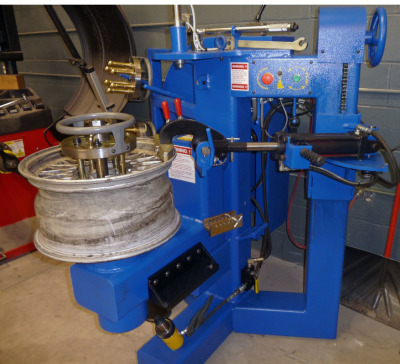 Hi-Tech Lehigh alloy wheel straightening machine is in the work process. 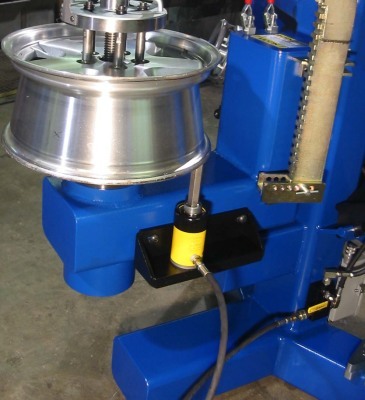 To distinguish a top-quality hi-tech wheel straightening machine with poor quality one in low price is quite easy. The common tools that are in the tooling package of those poor-quality wheel repair machines are actual hammers. Why do they need hammers if that wheel straightener is so called Hi-Tech repair machine? The answer is simple, the hydraulic system on those cheap machines is NOT Designed. 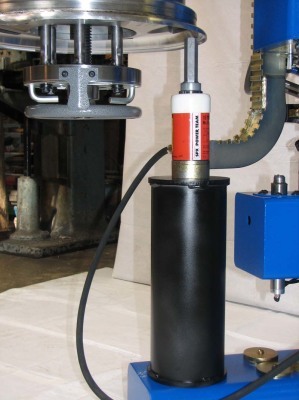 With Lehigh wheel straightener, the hydraulic ram can PULL out or PUSH back in both directions with controlled movement in both ways (see pictures above). 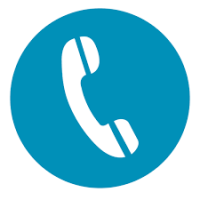 The lateral cylinder is used to fix the bent in the vertical direction. The working position when the alloy wheel is flipped to upside down for lateral action. The working position when the alloy wheel installed facing up position for fixing lateral bent. The lateral bent is considered as run out in vertical direction. Sometimes people talks about the “wobble” wheels in reference to the excessive sideway motion of the rim, which is resulted from the lateral bent. 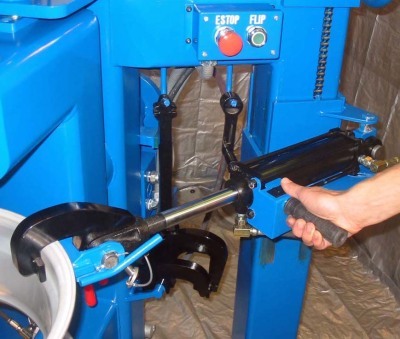 For most low-cost wheel straightening machines on the market, fixing lateral bent is mission impossible. 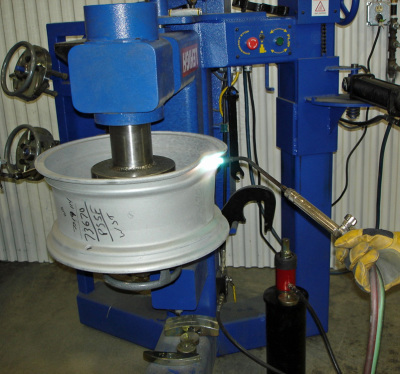 However, with Hi-Tech Lehigh alloy wheel straightening machine, the lateral bent can be fixed as shown in above pictures. 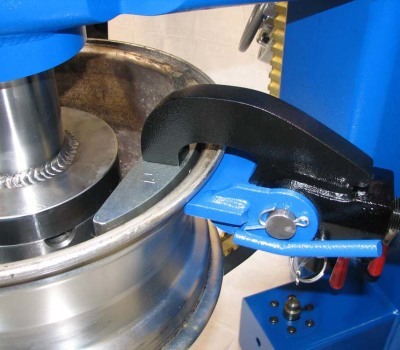 That is another major advantage for top quality Lehigh wheel straightening machines.